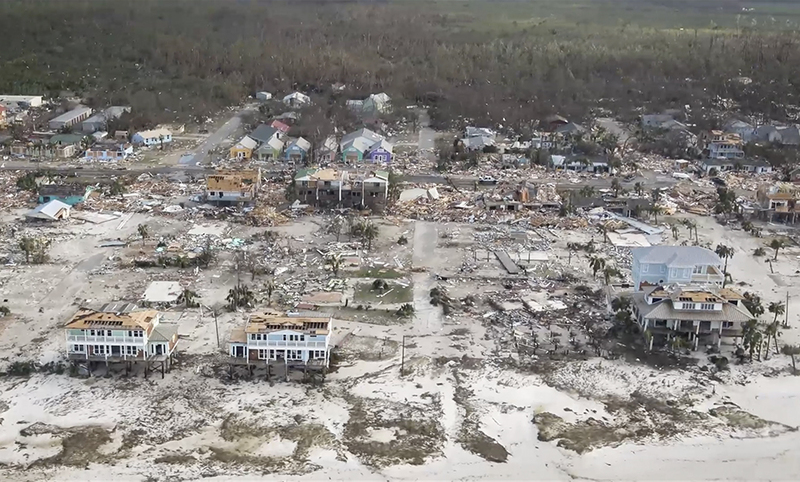 Aerial footage of Mexico Beach after Hurricane Michael. Joseph "Smokey" Parrish shows the tidemarks left by flooding at Buddy Ward and Sons Seafood's warehouse in Apalachicola. 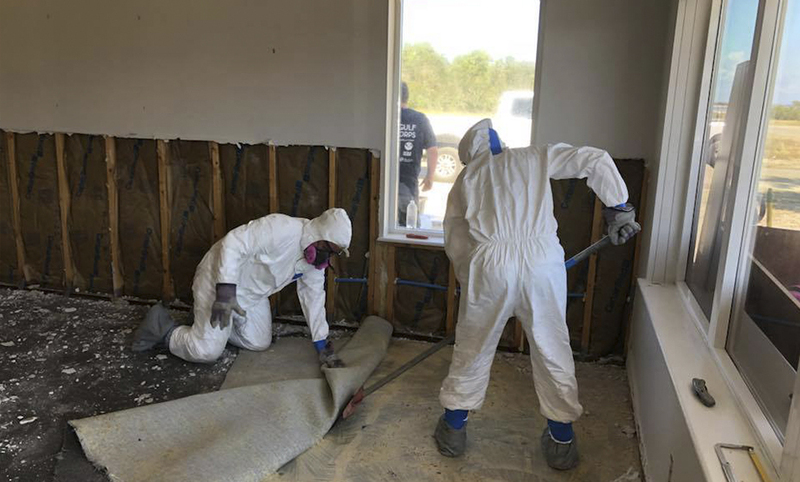 Conservation Corps students work on a flooded home after Hurricane Michael. Switzer and other volunteers set up mobile food pantries to help families in neighboring Gulf County. The Conservation Corps students removed dozens of trees from homes focused on senior citizens, low-income families and those with disabilities. The holidays might look a little different in the Florida Panhandle this year. In June, a wildfire gutted 800 acres in Franklin County, and then in October, Hurricane Michael brought devastation back – even more so for neighboring counties Bay and Gulf. Houses were destroyed, the landscape was changed and hundreds lost their jobs. The towns that dot Florida’s curved coastline along the Gulf of Mexico thrive on tourism and natural resources – in Franklin county, 87 percent of the land is protected for conservation, and there are fewer than 12,000 residents. Tourists flock to the area to enjoy pristine beaches, deep-sea fishing and renowned seafood. When Hurricane Michael sped through Apalachicola, Port St. Joe, Mexico Beach and Panama City with 155 mph winds, much of the area was destroyed. Despite tremendous loss, residents in this tight-knit, rural area have pulled together to overcome and be thankful this holiday season. 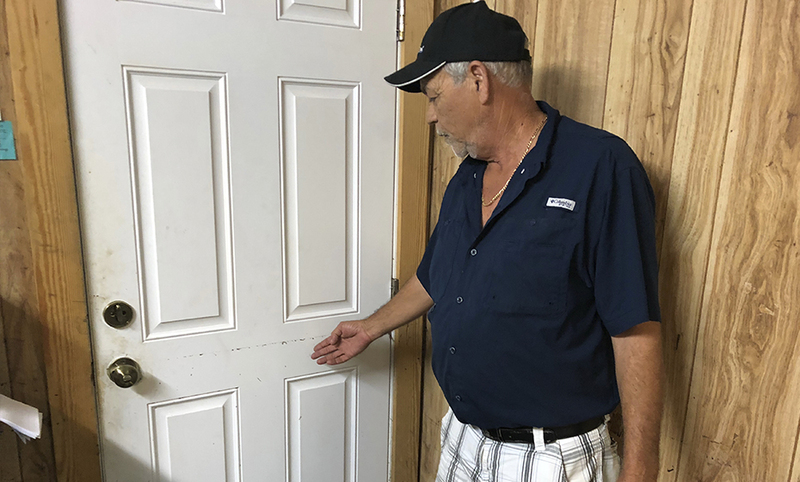 It’s times like these that remind Franklin County Commissioner Joseph “Smokey” Parrish what a mentor once said about crisis: You can’t fix everything at one time. All across the Panhandle, volunteers are doing just that. Joe Taylor, executive director of nonprofit Franklin’s Promise, is one of many who have been busy since the day the hurricane hit. He leads the local Conservation Corps, a program that trains 18- to 25-year-olds for careers in forestry and disaster response while earning their high school diplomas. Because they learned to use chainsaws and work with FEMA and law enforcement, they were ready to respond. With help from other nonprofits like Rotary International, which supplied tools and volunteers in the two weeks following the hurricane, Corps students logged nearly 1,400 hours of work – the equivalent of 35 weeks – delivering food, clearing debris, and removing trees from senior citizens’ houses and covering them with tarps until they could be repaired. Duke Energy has sponsored Conservation Corps since it was founded in 2015, and Taylor said that early support allowed them to be ready this year. With every person they helped, their capacity to help others grew. The first person they helped was Lori Switzer, who runs the food pantry. 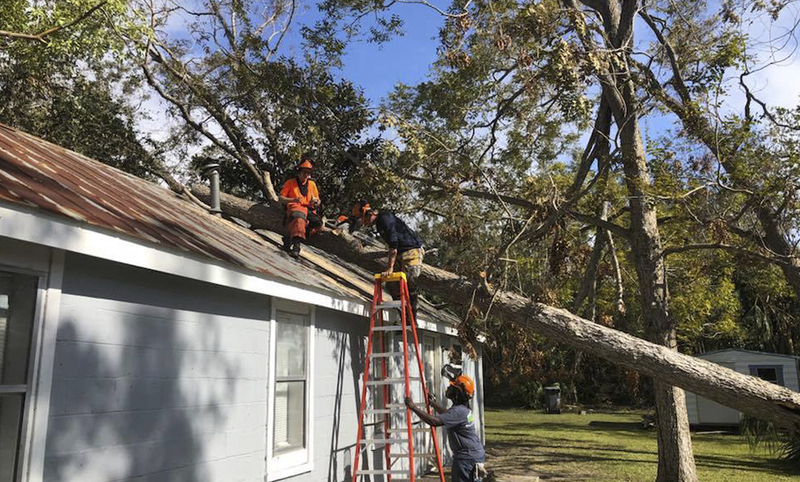 By removing the tree that fell on her house, Switzer could open the pantry and provide food for about 400 families two days after the hurricane. She opened extra mobile food pantries in Gulf County, too, because it was hit even harder than Franklin County. Switzer’s roof is still tarped because contractors are slammed with requests, and when she looks off her back porch, she sees the remnants of 25 splintered pine trees. She’s been so busy she hasn’t had time to get a chainsaw and clean her own yard. But she plans to get to it soon. Taylor is looking to his next projects, too. Working with Toys for Tots and the school board, he plans to donate toys, coats and shoes for about 700 children before Christmas. In the new year, he and other volunteers, including some of the Gulf Corps students, will help a faith-based organization rebuild hurricane-damaged houses for senior citizens. Taylor grew up in the area they’ll rebuild, and while the little concrete houses of his childhood are gone, he has hope that some of the things that make the Panhandle distinctive will remain. Parrish said he agrees because coming to Franklin County is like landing on an airplane – everything slows down. There aren’t big-box stores, movie theaters or chain restaurants, but the crime rate is low, the environment is pristine, and no matter where you came from, he said, people are going to shake your hand. 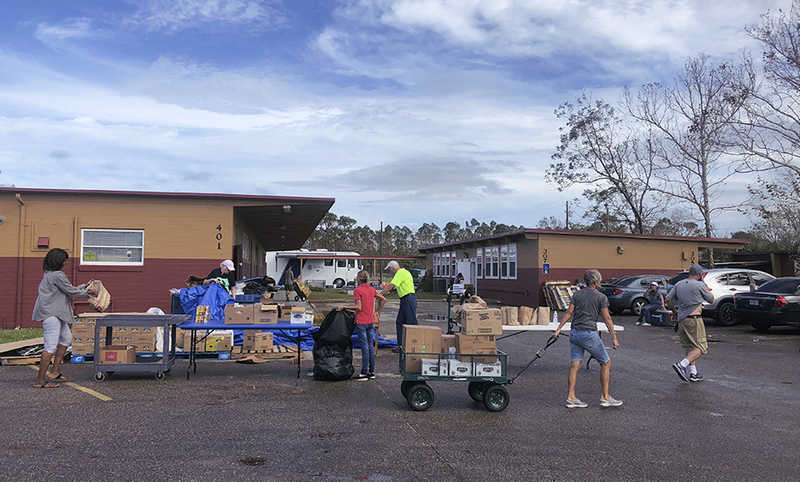 Volunteer Florida Foundation: $50,000 supported the Florida Disaster Fund, Florida’s official private fund to assist communities as they respond to and recover during times of emergency and disaster. Duke Energy was the first organization to give to the Volunteer Florida Foundation. Franklin’s Promise Coalition: $32,000 provided safe access and repair to homes of senior citizens and those with disabilities. The funds made it possible to purchase supplies for repairs and the costs to bring the Youth Conservation Corps from Mississippi and Pensacola, Fla., to assist. In addition, it provided 2,000 meals to Franklin County residents who were impacted by Hurricane Michael. Operation BBQ Relief Meals to Port St. Joe: The grant provided 600 meals for the residents of Port St. Joe on Oct. 15 and 16 delivered by Duke Energy employees in Tallahassee. Humane Society: Animal shelters were filled with pets, many of which experienced injuries during the storm or lost their owners. Franklin County Humane Society and St. Joseph Bay Humane society each received $1,000 for the animals’ medical bills.